Gardening Forum Show us your garden. Garden Talk. Anything and everything to do with gardens. Nancy rented two garden spots from the Puyallup park board. They were left fallow, we got a late start, but got them cleaned and planted with tomatoes, basil, green peppers, and green beans. There were three other plots that haven't been rented in several years so she rented two and is now cleaning the 3rd one. We'll have to get a rota tiller in though as the grass is to thick to dig by hand, especially with our bad joints. Comfrey is growing wild in this area and a PITA to get out - morning glories, too. We went to Duris Farm today but they don't open till 1 Aug. when their cukes are on. I'll get some for my refer dills. There is still two jars of hamburger slices from last year and need to eat them up. Since we were out we went for a drive to another farm and got 6 pepper plants that were buy one, get one free. 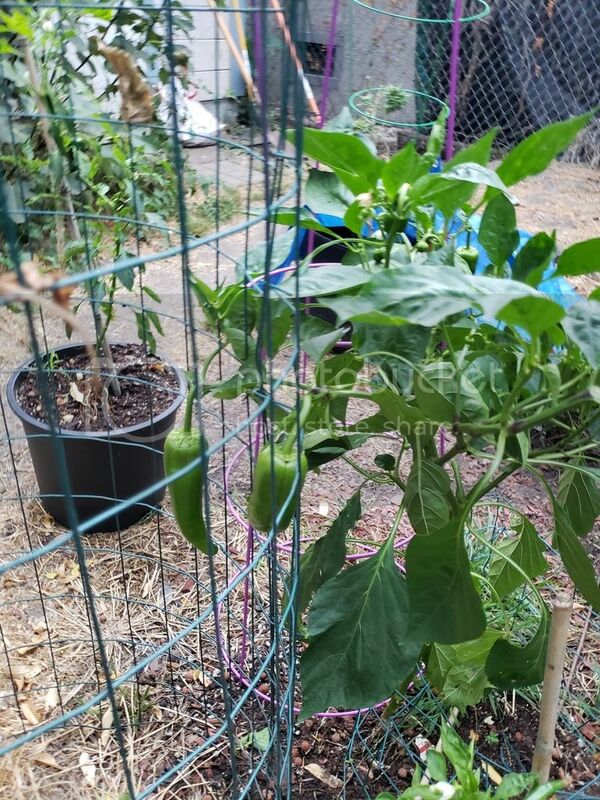 We got two ancho, two jalapeno, and two 7 pod from the Caribe. On the way home we stopped back at the garden and planted the peppers where the Swiss Chard used to be - there are baby rabbits all over and the critters ate them down. My bud in Marshalltown, Iowa has the Tremont Restaurant - on the roof he had gardens which they grew herbs and lettuce. The roof was mostly destroyed, lost all the gardens, flowers, 28 A/C units, and the stove hoods. Luckily, no one was hurt and he has 100% insurance. Folks come together when there is a disaster - JP's friends all brought him new plants to replace the one's lost in the tornado. Lennox donated AND installed all of his destroyed A?C units. Here are pics of our garden this morning. we are starting to get little tomatoes on the Big Boys. We have Big Boys, heirlooms, and cherry tomatoes. 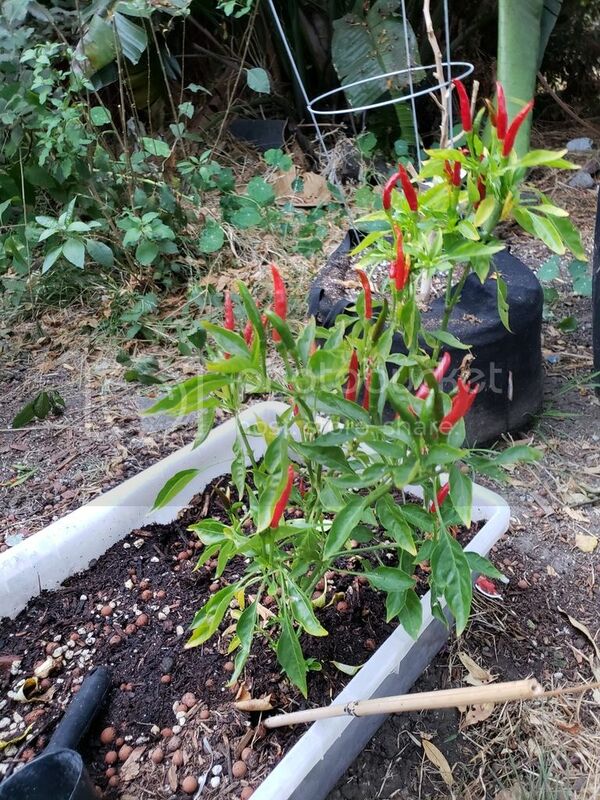 I think we got conned on the hot peppers - they are doing nothing. We plan to garden into the winter - I need to get the name off the watercress like salad plant that grows in the winter. Wow, John - first time I've seen this thread! You've done a terrific job with that garden! Lotta work upfront, for sure! Good story about your friend being helped get back on his feet! These two required some work and I helped - I carried a lot of weeds and helped with pulling. All the credit goes to nancy, though. She started all these plants from seed, too. We are behind but our season lasts ling into the Fall. The big garden she rented she is digging and pulling the roots out by hand. The comfrey is horrid and will have to do something about it. We aren't allowed plant killers so will try 30% vinegar. We aren't supposed to use fertilizers either but know everyone does. Thanks Chowder! It was miner's lettuce of what I was forgetting. Nancy text to say someone has been digging in our new garden. We'll have to call the park lady to sort that out. Wow, that would have me very upset. What we see and taste as beautiful depends largely on what our family and friends approve of .. with just a little room for personal preference. Before we left we left a polite note attached to the fence saying not to did in our garden. Last evening we stopped on our way home and Kay (?) left a note apologizing. Everything has gotten huge in the last week and starting to get tomatoes showing. The cherry tomatoes are doing the best. My first attempt at peppers. Cayenne, Poplano, & Costa Rican Sweet. Plus, a pic of my Pomegranate tree. My Buddy, My Pal, My friend Hallie in the back ground. She is a Tri-Black Australian Shepard, mixed with Husky. She has a brown & Blue eye. Life is not about trying to ride out the storm..but learning how to dance in the rain! Last edited by dansdiamond; 10-04-2018 at 10:49 AM. This is the first time I've ever seen a pomegranate tree! Never thought about how pomegranates grow!